Ben Raue lives in Sydney and is the resident data analyst for GetUp. If you’re interested in Australian elections (and other elections) his blog The Tally Room is worth following on Twitter (as is Ben’s twitter account). I’ve also just added Ben to my list of favourite Australian Political Blogs here. Regarding the next ACT redistribution (which includes an expansion of the ACT Assembly from 17 to 25 seats) there has already been a few drafts circulated by “insiders” speculating about the size, shape and composition of the new five electorates. As Ben correctly points out, the guiding principals that Elections ACT will use to manage the redistribution process are pretty clear. There is a growing consensus that the five electorates will be based on Tuggeranong, Woden/Weston, the Inner city (including the parliamentary triangle south of the lake that divides the city), Belconnen and Gungahlin. There have been approximate maps of such an arrangement previously distributed by former Greens candidate and Gungahlin Community Council President Alan Kerlin during the most recent redistribution process in the ACT in 2011. Ben provided a rough map in a previous post here which gives an approximate shape for each likely electorate based on past booth locations. Would there be any consequences if the size of electorates were allowed to differ greatly from average? Say by changing the margin at the date of the election from +/- 5% to +/-10%? This would certainly allow more long-term stability in the boundaries. Canberra is a very well-planned city were population projections can be fairly well predicted years in advance. However the Electoral Commissioner has previously argued that a tighter margin is fairer as it reduces the disparity in the value of votes between different electorates. Antony Green also posted on this topic earlier this year. other options? 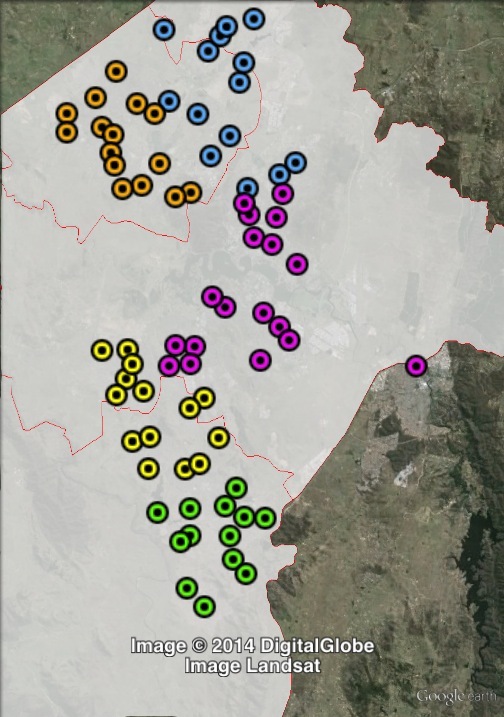 There was a radical proposal in 2011 to move the larger seven-member electorate to encompass both Belconnen and Gungahlin. Such a radical redistribution is unlikely and it’s probably unlikely two major town centres would be combined due to the fact it will make further radical redistributions almost inevitable. This entry was posted in Interesting blogging from someone else and tagged ACT, antony, assembly, Ben, canberra, clark, green, hare, PR, raue.